First lady Michelle Obama has your back if you’re a high school student even just thinking about going to college. The Princeton University graduate knows the importance of education in today’s culture. She also realizes that many high school students aspire to go to college, but often face obstacles that prevent them from enrolling and attending. So she’s dedicated time and resources to develop initiatives such as Reach Higher and the Better Make Room campaign. As part of the first lady’s initiatives on higher education, she hosted the third annual “Beating the Odds” Summit for the students who have overcome great odds to get into college. More than 130 college-bound students flooded the White House on Tuesday, where it was all about higher education. According to the U.S. Bureau of Labor Statistics, 2.2 million freshman students (68.6 percent of all 2008 high school graduates) were enrolled in college as of October 2008. In October 2015, 69.2 percent of 2015 high school graduates were enrolled in colleges or universities, the U.S. Bureau of Labor Statistics reported in April. The students came from a vast array of life experiences. They traveled from across the country, representing urban and rural areas, foster children, homeless, special needs, and under-represented youth. The commonality between the groups was that they have overcome substantial obstacles to persist through high school and make it to a postsecondary institution. The opening panel was televised. Reach Higher’s executive director Eric Waldo delivered opening remarks and introduced a panel led by author and BridgeEdU chief executive officer Wes Moore with current college students and recent college grads about best practices for success. The first lady’s panel started later Tuesday morning. It was moderated by YouTube personality Tyler Oakley, who sat down with the first lady in 2014 as part of a Reach Higher “Back to School” event. She was joined by U.S. Secretary of Education John B. King Jr., current Washington State University student Rachel McKenzie Scott, who is in Washington State’s Foster Until 21 program, and musical artist Jidenna, who joined Obama this spring at her College Signing Day event in Harlem, New York. 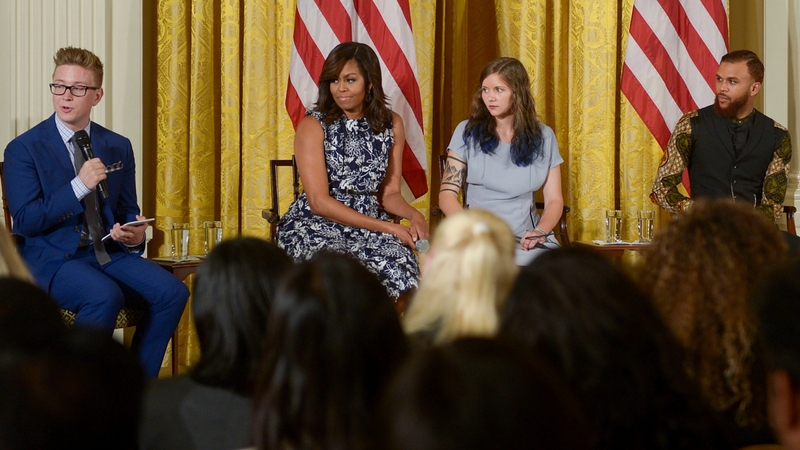 YouTube personality Tyler Oakley moderates the third Annual Beating the Odds event, welcoming more than 130 college-bound students representing urban, rural, foster, homeless, special needs, and under-represented youth, in the East Room of the White House on July 19 in Washington, D.C.
Jidenna attended Stanford University and his parents were immigrants from Nigeria. The first lady dished out four pieces of advice to the students. The first was to research if their college offered a summer program to help them become acclimated to the campus environment before the start of their freshman semester. The next is to go to class and be fairly organized. The last piece of sage advice from the first lady was not to be afraid to ask for help. Throughout the day, the students, who are sponsored by 66 nonprofit organizations, participated in workshops and panels. The sessions focused on sharing tools and strategies students can use to successfully transition to college and the resources they will need to complete the next level of their education. The day concluded with an afternoon performance by Jidenna. 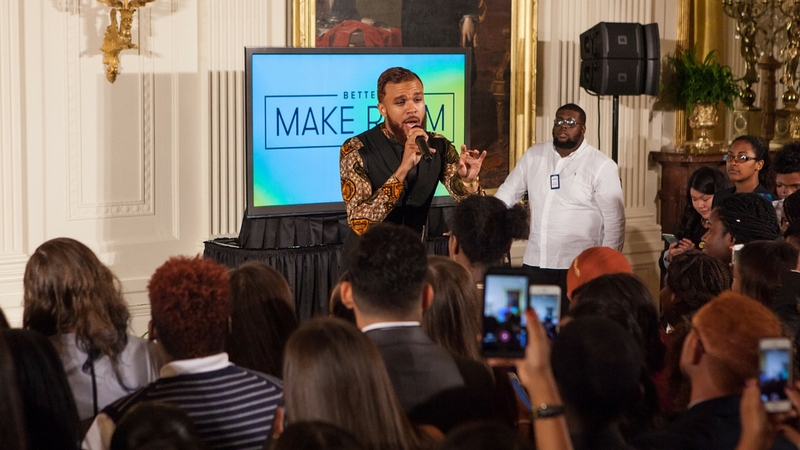 On July 19 in the East Room of the White House, as part of first lady Michelle Obama’s Reach Higher initiative and Better Make Room campaign, musical artist Jidenna performed for over 130 college-bound students.